Fri., Oct. 26, 2018, 4:27 p.m.
A rout in technology shares deepened Friday, threatening to push the S&P 500 Index into corrective territory along with the Nasdaq Composite Index, in one of the most volatile weeks this year. Treasuries and gold rose as investors sought refuge. The S&P 500 finished just short of a 10 percent decline from its record September high, and remains on pace for the worst month since 2009. The tech-heavy Nasdaq indexes bore the brunt of selling after Amazon.com and Alphabet sank on disappointing results. The Chicago Board Options Exchange Volatility Index shows price swings are the greatest since February. Investors got a brief reprise after a report showed the U.S. economy expanded at a higher-than-forecast 3.5 percent pace last quarter. The rout that had largely been contained to equities spilled into other assets Friday. Gold spiked toward the highest since July and the rally in Treasuries pushed the two-year note yield down 10 basis points this week. Yields on benchmark 10-year notes have slumped 11 basis points, the biggest weekly decline since May. In Europe, the Stoxx Europe 600 Index continued its retreat, heading for the biggest monthly drop in three years. Asian shares sank deeper into a bear market earlier. Core European bonds gained as the risk-off mood spread. Markets remain on edge after more than $6.7 trillion was lost from global equities’ value since late September, as lofty expectations for earnings were tested amid heightened trade tensions and tightening financial conditions. Meanwhile, West Texas oil briefly dipped back below $67 a barrel and copper closed the week lower. The offshore yuan extended this week’s slide to trade at the weakest since January 2017, while the yen pushed higher. Emerging-market stocks tumbled to the lowest in 19 months, capping a fifth straight week of losses. 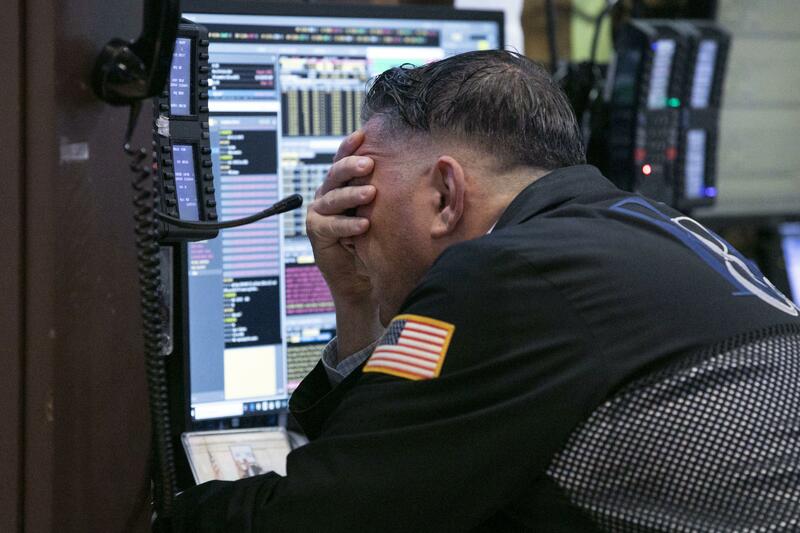 The S&P 500 dropped 1.7 percent to 2,658.57 as of 4:04 p.m. in New York, while the Dow Jones Industrial Average fell 1.2 percent to 24,688.31 and the Nasdaq Composite Index declined 2.1 percent to 7,167.21. The Stoxx Europe 600 dropped 0.8 percent. The U.K.’s FTSE 100 slumped 0.9 percent. Germany’s DAX Index fell 0.9 percent. The MSCI Emerging Market Index eased 0.9 percent. The MSCI Asia Pacific Index slumped 0.3 percent. The Bloomberg Dollar Spot Index fell 0.3 percent, after reaching a 17-month high. The euro gained 0.3 percent to $1.1411. The British pound rose 0.2 percent to $1.2836. The Japanese yen strengthened 0.6 percent to 111.77 per dollar. The yield on 10-year Treasuries fell four basis points to 3.08 percent, while the two-year note yield eased four basis points to 2.81 percent. Germany’s 10-year yield fell five basis points to 0.35 percent. West Texas Intermediate crude rose 0.7 percent to $67.80 a barrel. Gold rose. 0.2 percent at $1,234.70 an ounce. With assistance from Bloomberg’s Robert Brand and David Wilson. Published: Oct. 26, 2018, 4:27 p.m.